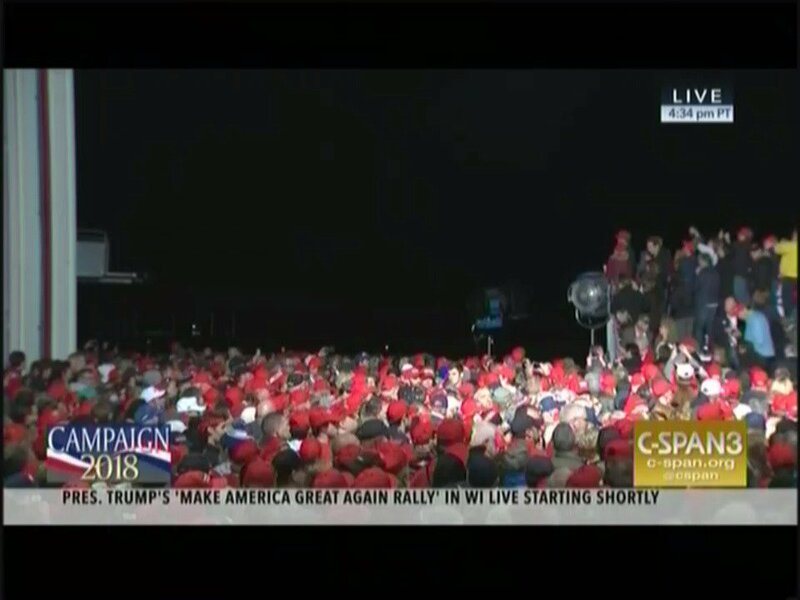 Thread by @atrupar: "President Trump is about to deliver a speech in Mosinee, Wisconsin. Follow me for a video thread. 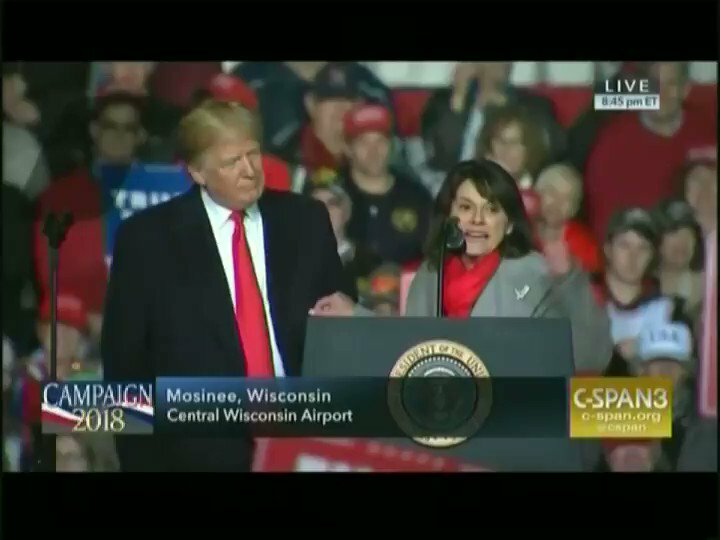 Here we go Trump begins by trying to play […]"
President Trump is about to deliver a speech in Mosinee, Wisconsin. Follow me for a video thread. Trump begins by trying to play unifier-in-chief. 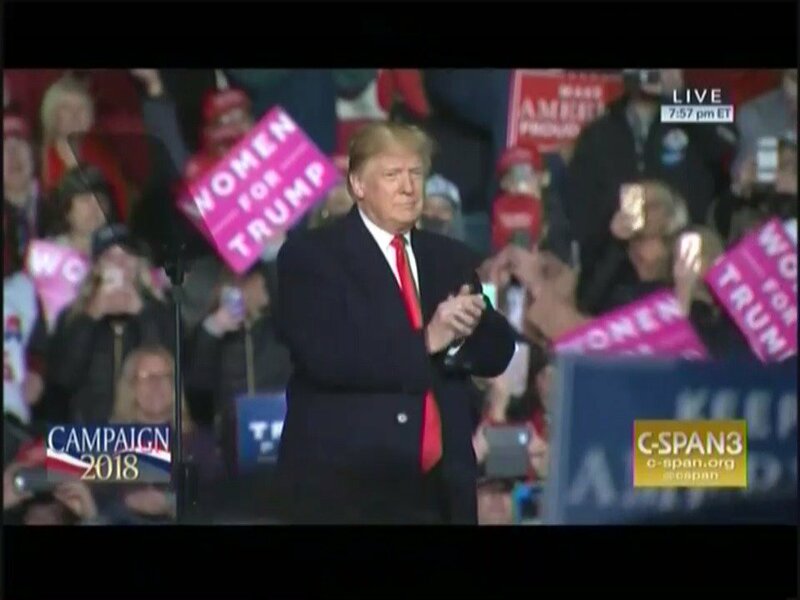 "Those engaged in the political arena must stop treating political opponents as being morally defective... We should not mob people in public spaces or destroy public property." But he then attacks the media for "false attacks." 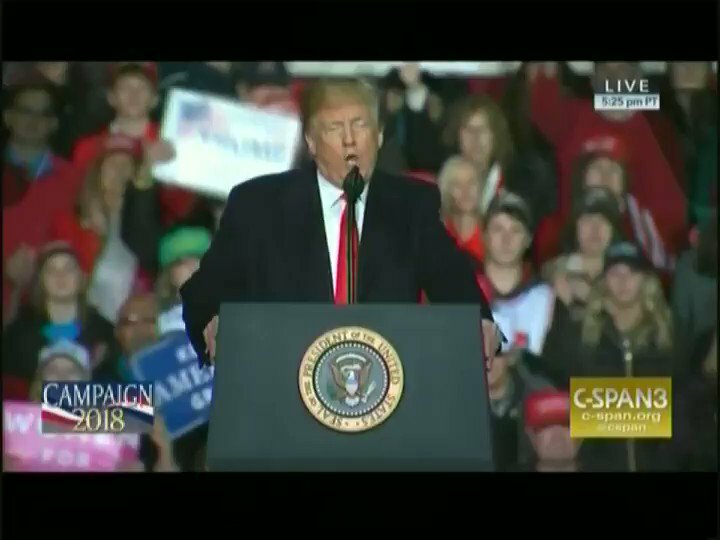 All things considered, TRUMP offers a relatively normal response to the bombs sent to Democrats: "We must accept the verdicts of elections and remember that America's greatest achievement have always been those endeavors we embarked on together." 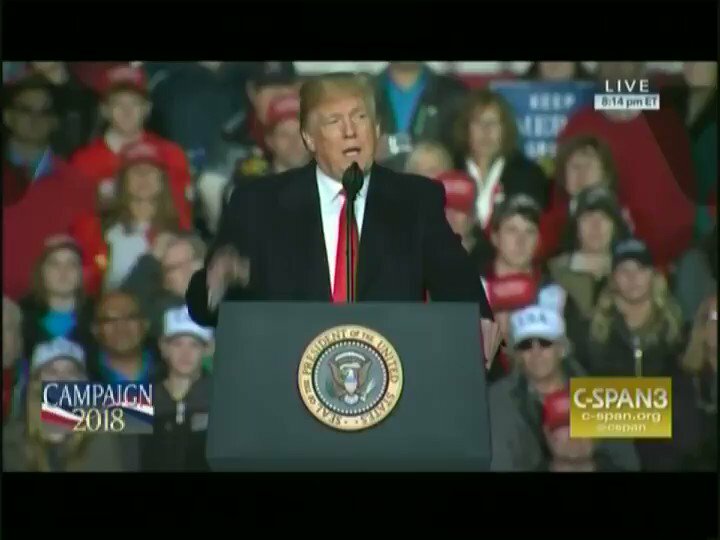 TRUMP touts his low-key tone: "By the way, do you see how nice I am behaving tonight? Have you ever seen this? We are all behaving very well. Hopefully we can keep it that way, right? We are going to keep it that way." 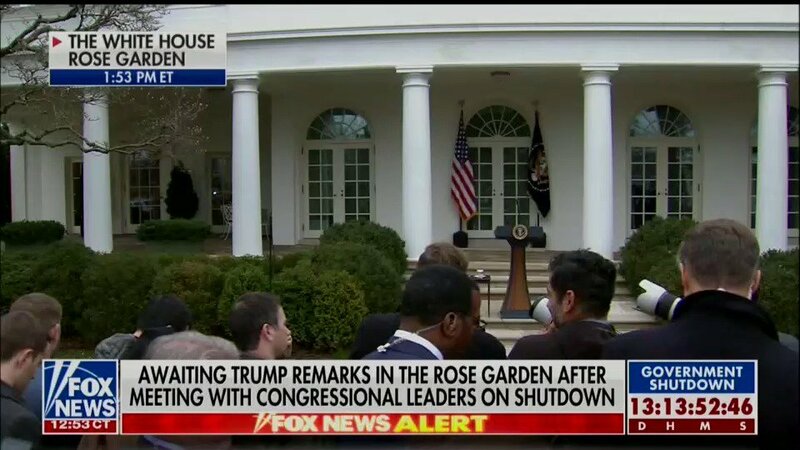 The audience, not enthused about chill Trump, break out in riotous "Build the wall!" 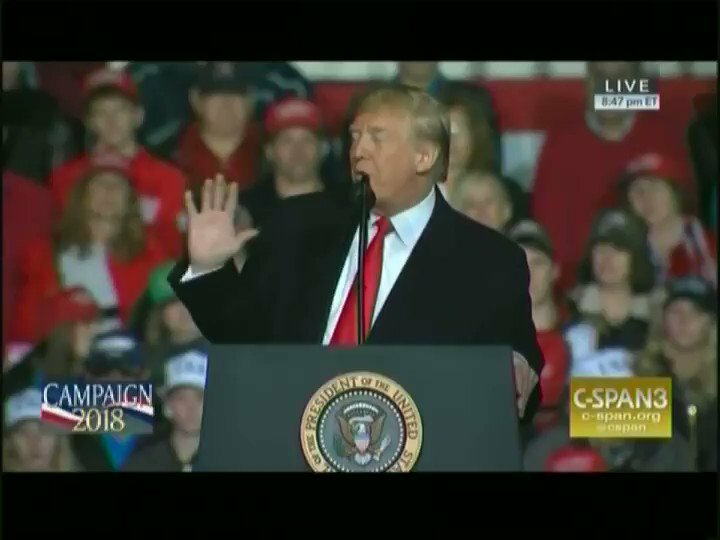 chants as soon as he mentions the border. 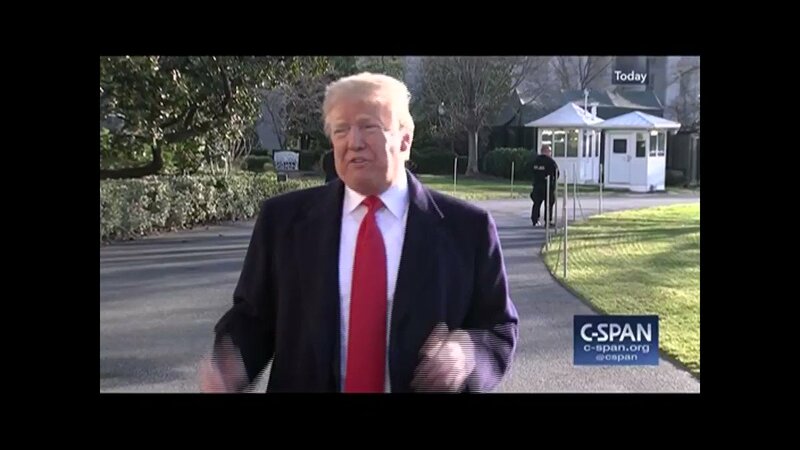 WOW -- After lying about his border wall, Trump says the military is "all set" to deploy to the border "over the next couple of weeks," presumably to do something about the migrant caravan that is currently making its way through Mexico. 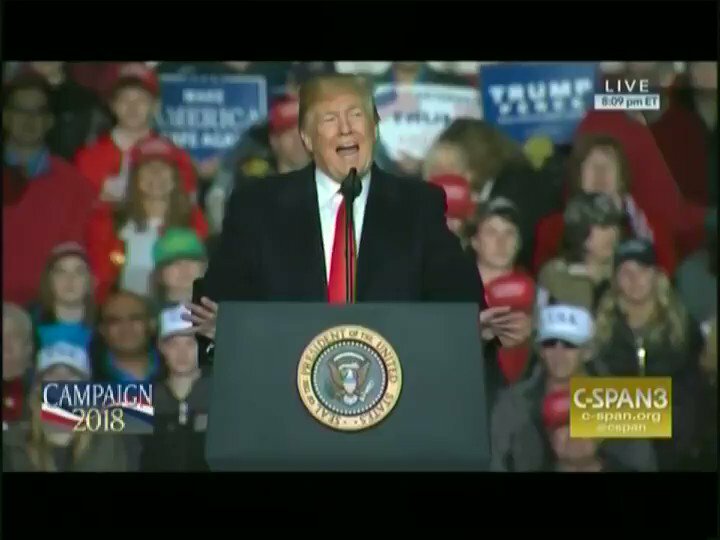 TRUMP accuses Democrats of "writing rules and regulations that are worse than anything you have ever seen" with regard to immigration, but promises that "ultimately we will get to the Supreme Court and hopefully they will straighten things out." 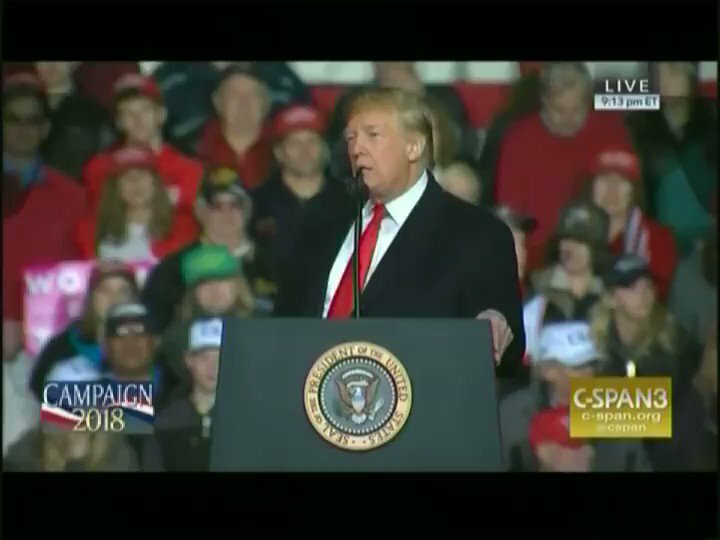 Trump touts his mystery middle-class tax cut: "We have passed a massive tax cut for working families and we will soon follow it up with another 10% tax cut for the middle class. That is all for the middle class. 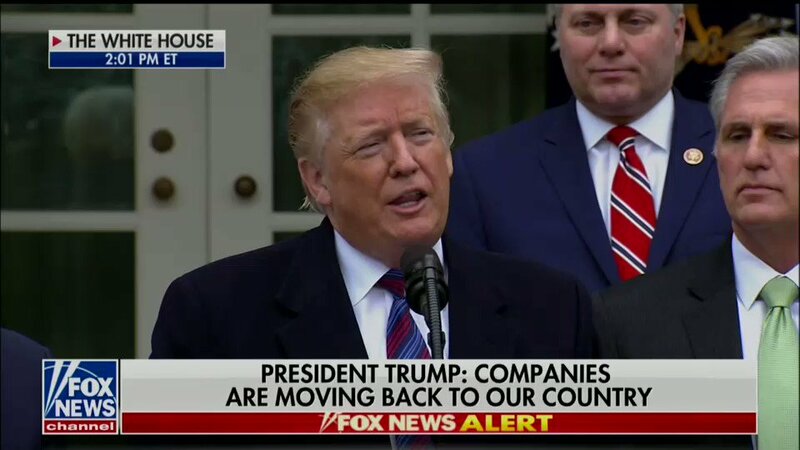 That is on top of the tax cut they already got for the middle class"
Trump can't resist taking credit for the Foxconn plant opening in Wisconsin, says that he "set up" Gov. Scott Walker "with an incredible company, they make much of the Apple product." 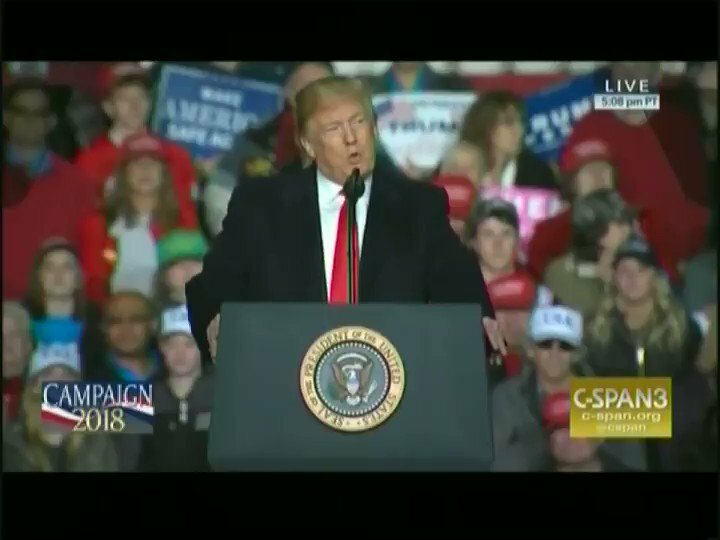 Trump mimics how desperate, apparently raspy-sounding farmers allegedly came up to him during a previous trip to Wisconsin & purportedly begged him for "help" bc Canada "put a surcharge on our dairy product." 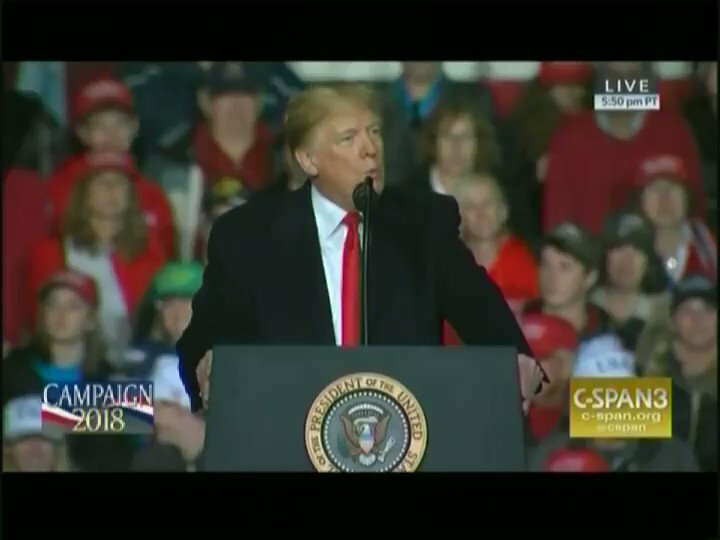 TRUMP: "I will never forget, we are in WH, I say 'Judge [Kavanaugh], I am going to choose you for SCOTUS. Judge, this is going to go so fast, you are so perfect, you don't have a thing wrong, you are the best, number 1 in your class, beautiful wife'... Then they made him suffer." 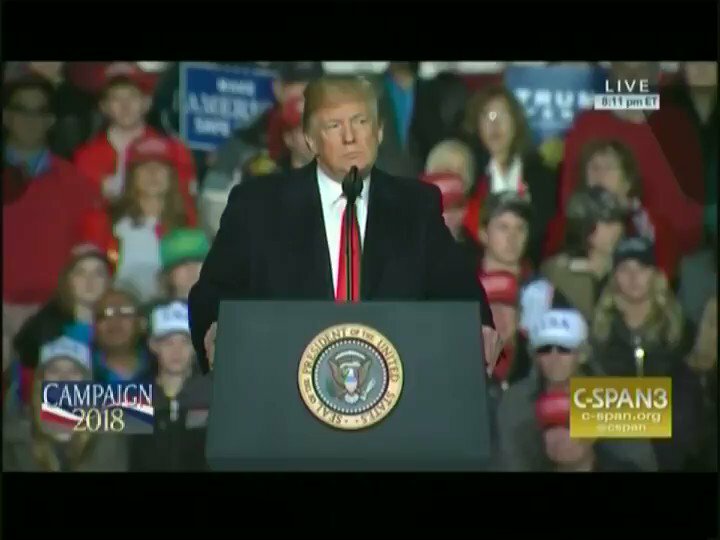 Trump falsely claims "many presidents don't get a chance to put a Supreme Court justice on." Trump apparently spontaneously tries to bring @SpeakerRyan on stage, but isn't able to. 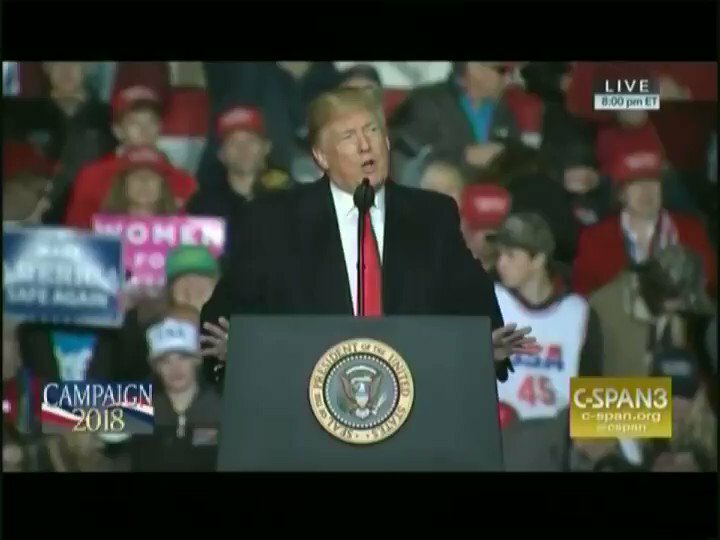 It's notable that we're more than 30 minutes into this speech and Trump hasn't yet blasted the "fake news" or goaded the audience into booing the press. I can't think of another speech where he hasn't done those things. 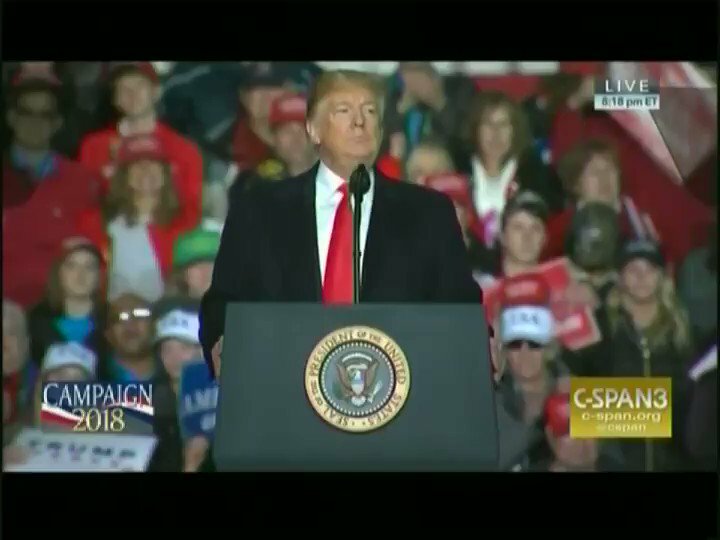 Trump again touts his attempt to be civil: "Who wants a socialist takeover of health care? I am trying to say that very nicely. Normally I would scream it. 'They want a socialist takeover!' I am trying to be nice. But it is true." 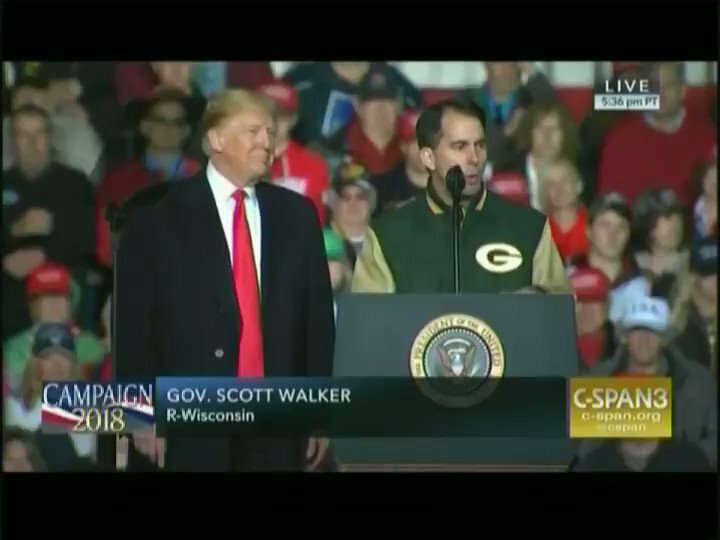 Trump demonstrates a very shaky grasp on the history of Wisconsin politics: "Scott Walker is a tireless warrior. He is a warrior. Didn't he win like 3 elections last time? He is the only guy who gets elected three times! He doesn't stop. He is a warrior. 3 times!" Totally shameless - @ScottWalker, whose state is currently suing federal govt to end protections for people with preexisting conditions, says, "I want to reinforce it to everyone - we will always cover people like my wife w/preexisting medical conditions. Don't believe the lies!"
. 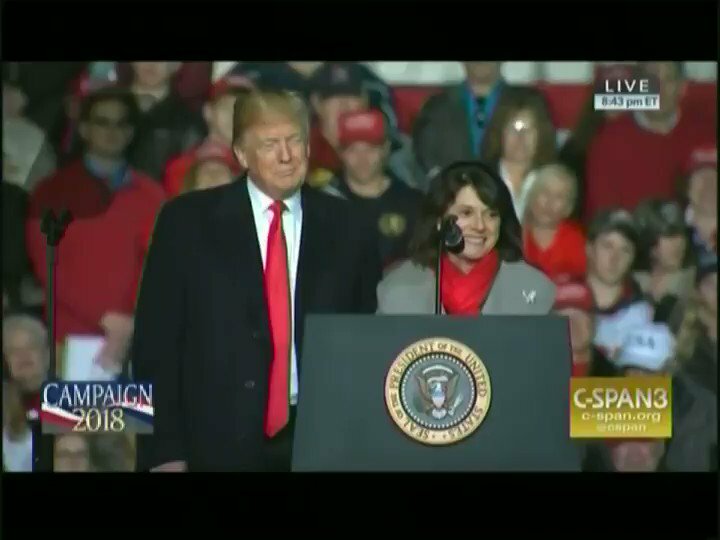 @LeahVukmir tries to gaslight audience about GOP's position on preexisting conditions, characterizing claims that the GOP doesn't want to protect people w/preexisting conditions as "a big lie." "I will fall in front of a truck before I let people go without coverage!" she says. 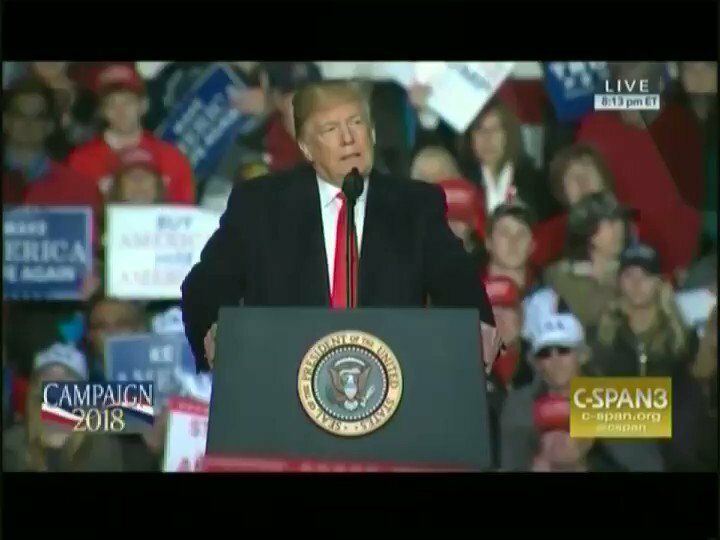 TRUMP: "If you look at the early voting this 'blue wave' does not seem to be doing so well. 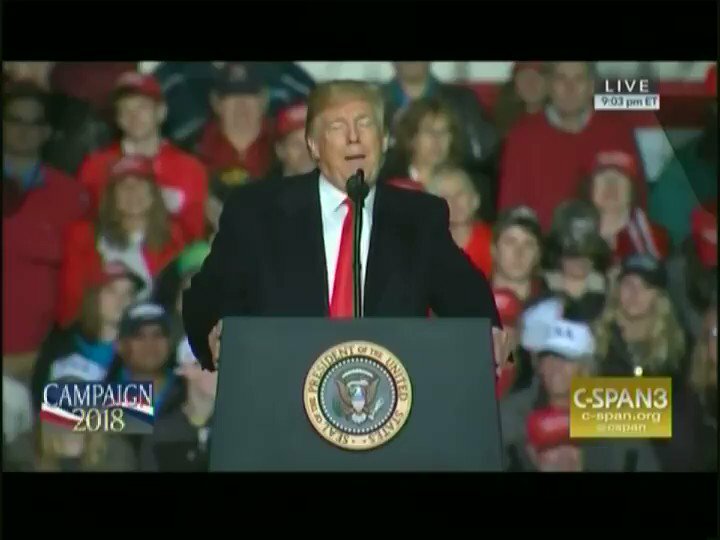 What happened to the blue wave!...I'd better be a little careful bc if we don't do quite as well as we are thinking we're going to do I'll be all over television w/these exact remarks!" 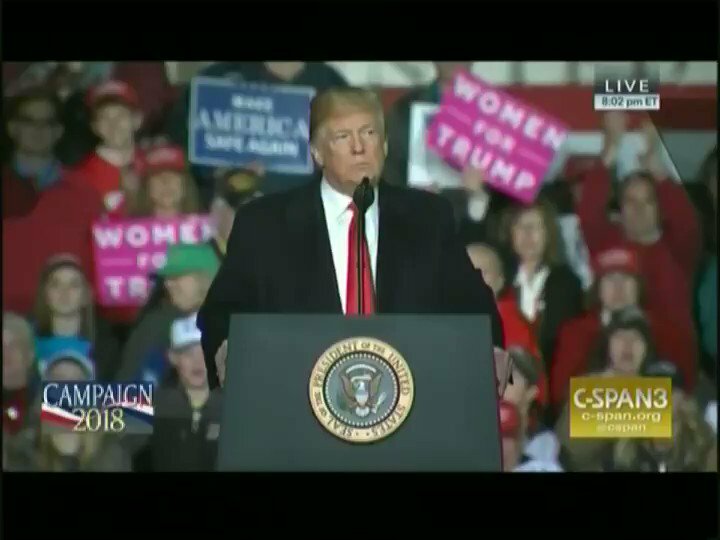 Trump absurdly claims that when ICE "liberates" towns on Long Island from MS-13, "it's like watching World War II movies. It's like watching documentaries on World War I & World War II. They get them, they take them out, and the people on their windows are clapping." 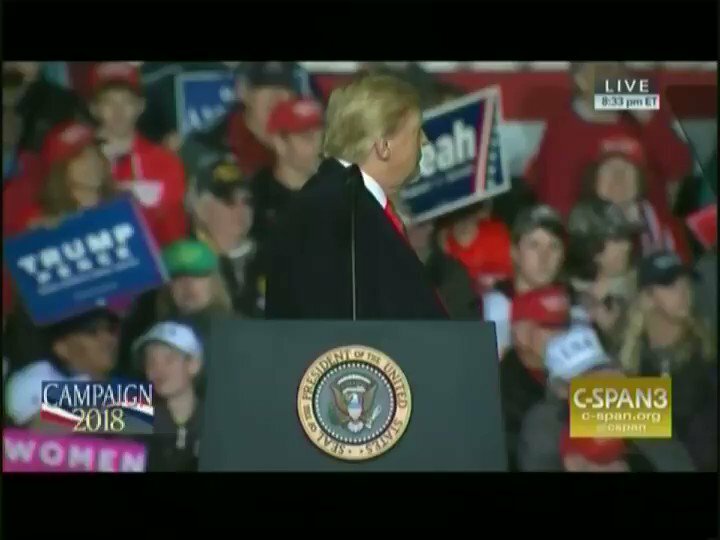 Trump "jokes" that if Scott Walker loses the election, he will pathetically call the White House looking for help. 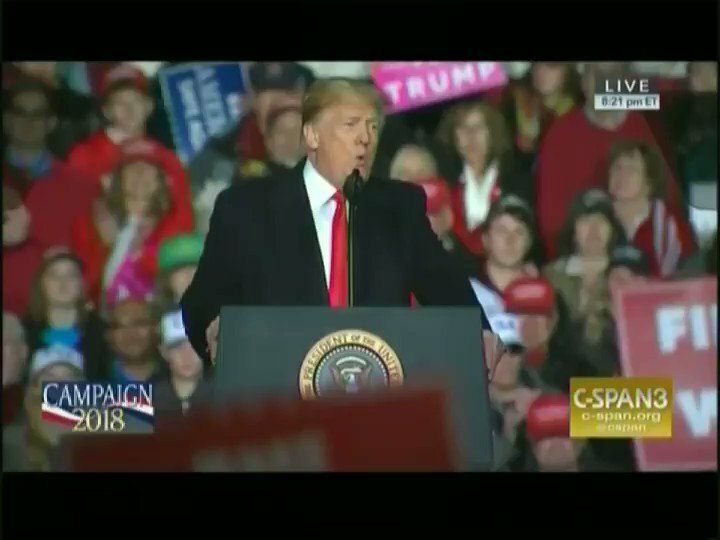 Trump says he'll ignore the call. 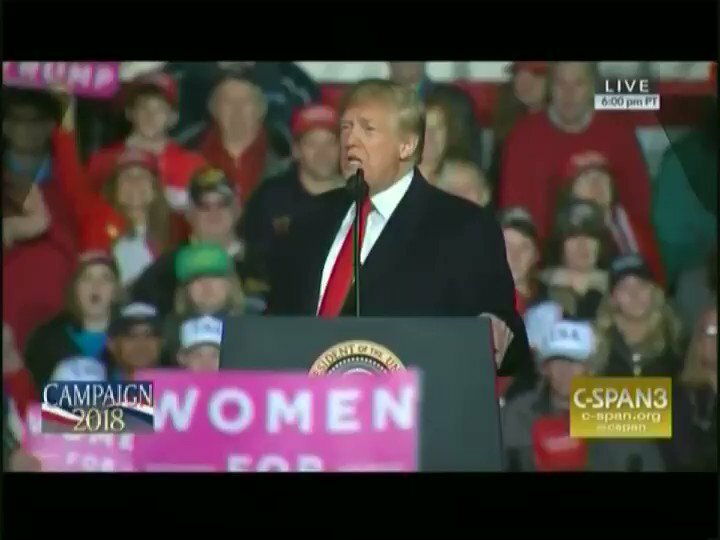 Trump mockingly mimics how leaders of other countries come to him begging to not be hit with tariffs. 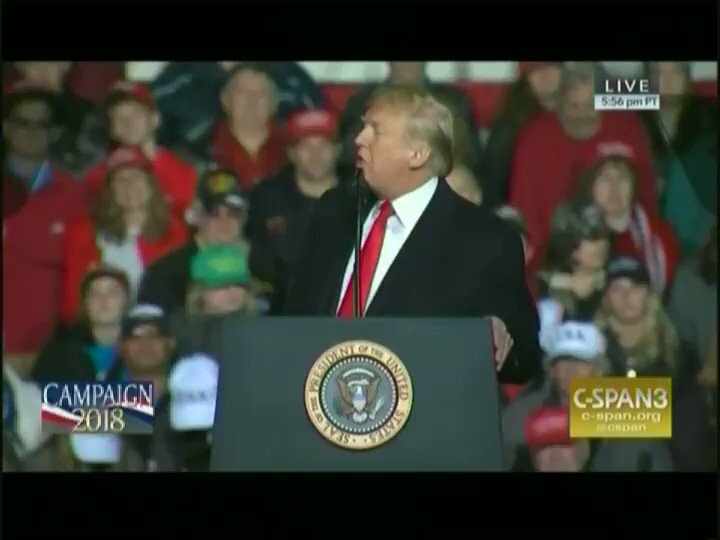 "They don't want those tariffs. They'll sign anything but tariffs -- 'please. 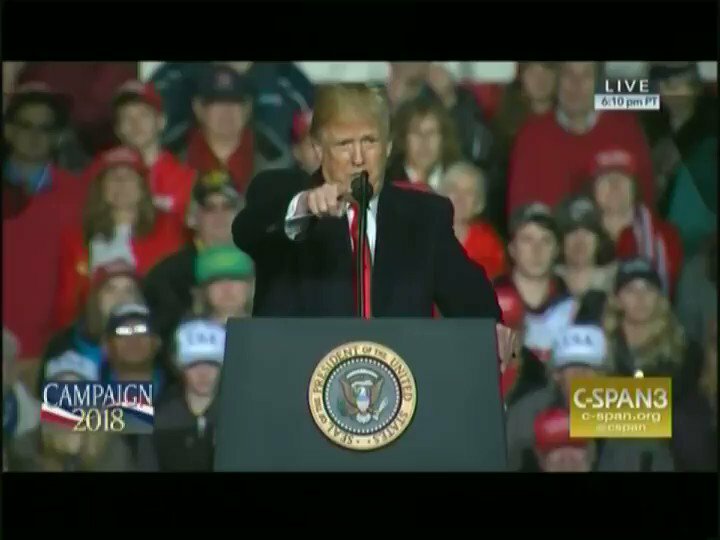 Don't do that to me, President Trump! We don't want tariffs. 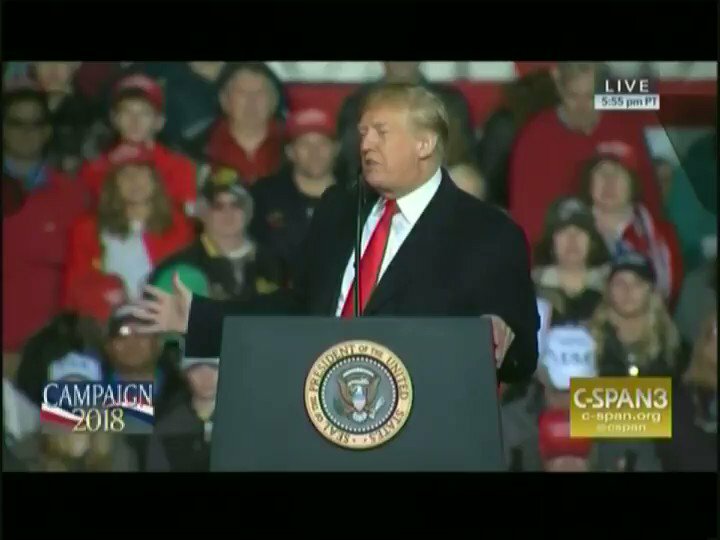 We don't want tariffs, please!'" Trump puts himself over by giving detailed, dubious accounts of his private conversations with the leaders of South Korea and Japan. 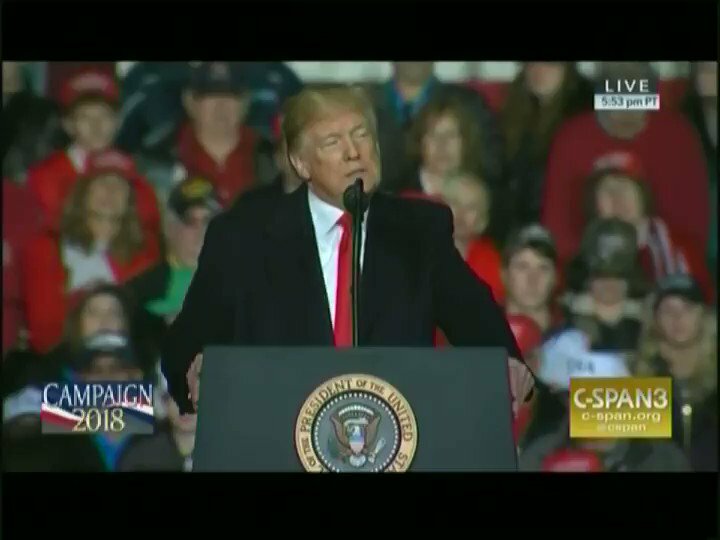 Trump then adds that "we now have a great relationship now with Kim Jong-un." 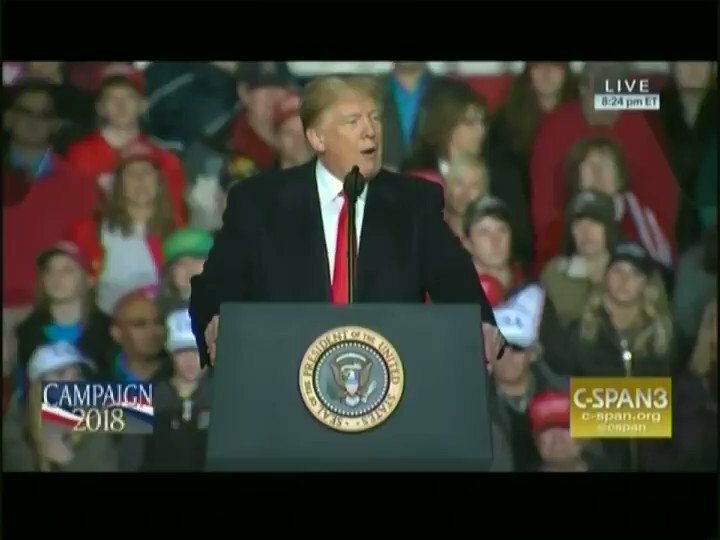 The totalitarian dictator gets loud cheers from his fans. 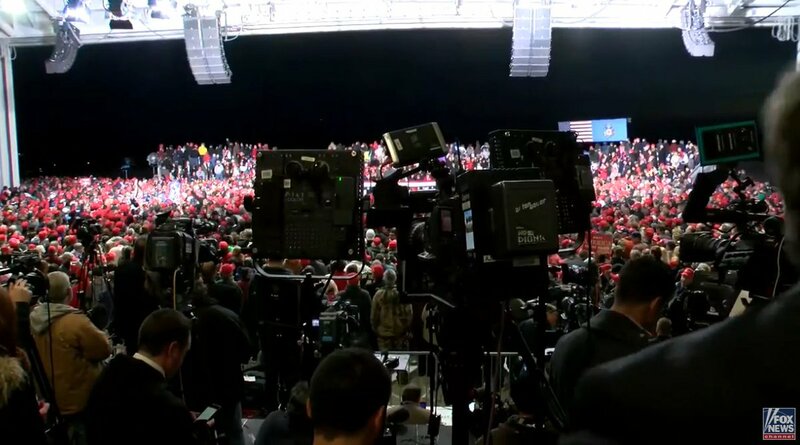 The only thing that can get Trump to stop boasting about himself is when someone in the crowd has a medical emergency. 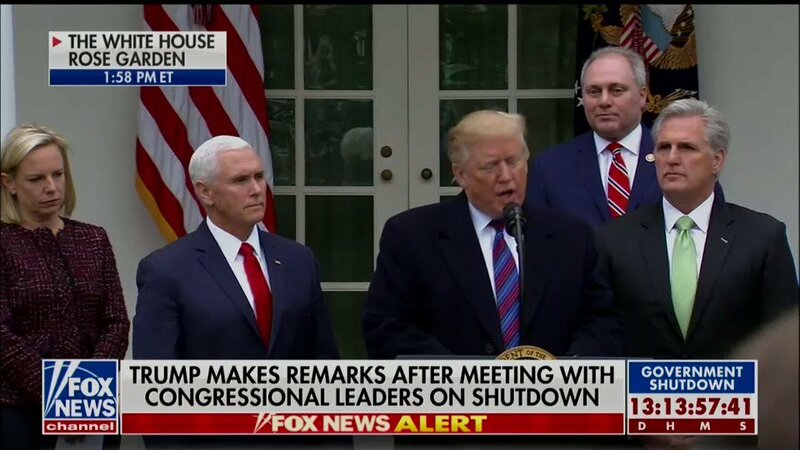 As soon as the emergency is over, Trump resumes bragging. 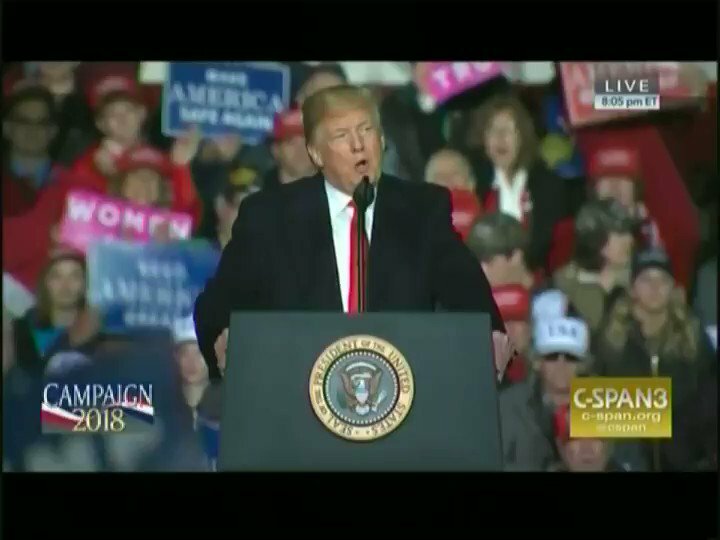 Trump's relatively tame speech - one delivered on same day a number of prominent Democrats & CNN were targeted by bombs - ends without him at any point uttering words "fake news." CHRIS WALLACE: Why not fund agencies that have nothing to do w/border wall & not hold these workers hostage? 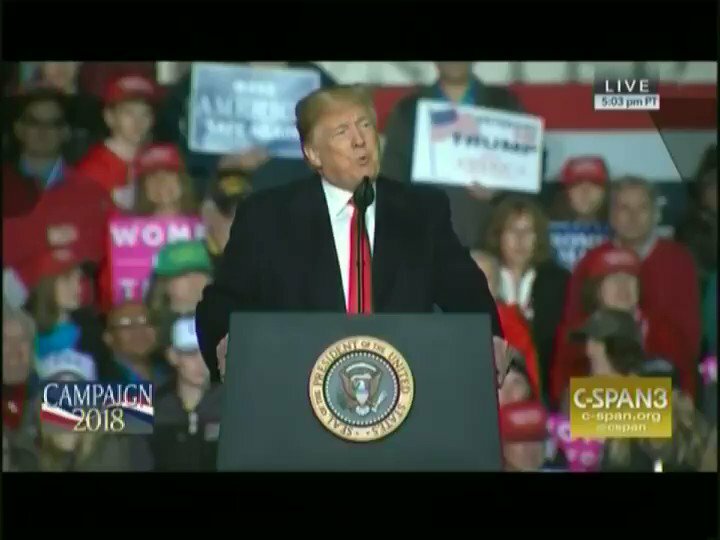 @PressSec: "We have to stop kicking can down road"
CW: I'm not talking about Homeland Security. 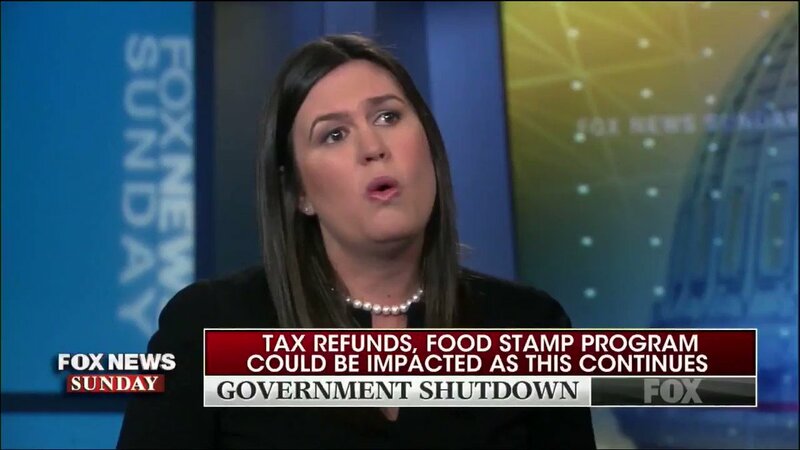 Why not fund Treasury? 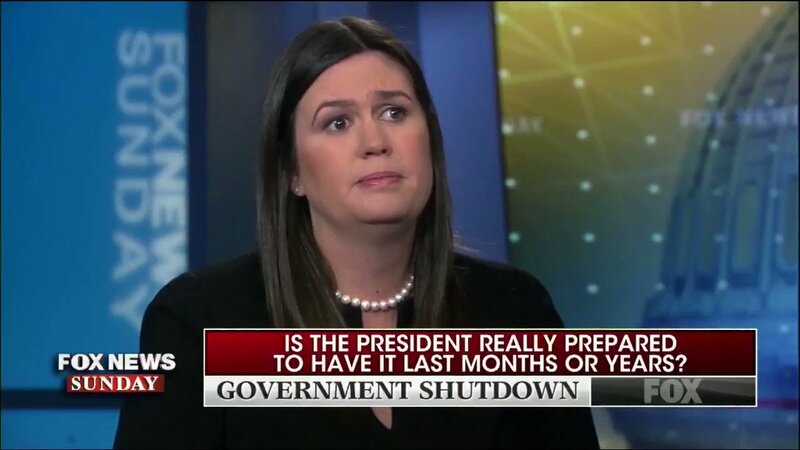 SANDERS: "Look, POTUS wants to do it all at once"
WOW - Sanders tried to push misleading stats about "terrorists coming across southern border," but Chris Wallace immediately shut her down. 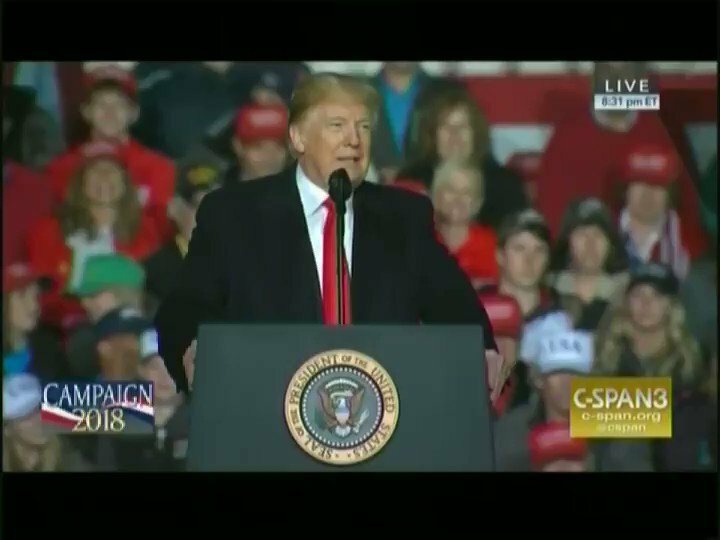 "The State Dept says there hasn't been any terrorists coming across the southern border!" he tells her. "They're being stopped at airports"
The Trump administration has already gotten caught lying about these numbers. They are using naked fear-mongering in desperate attempt to generate hysteria. 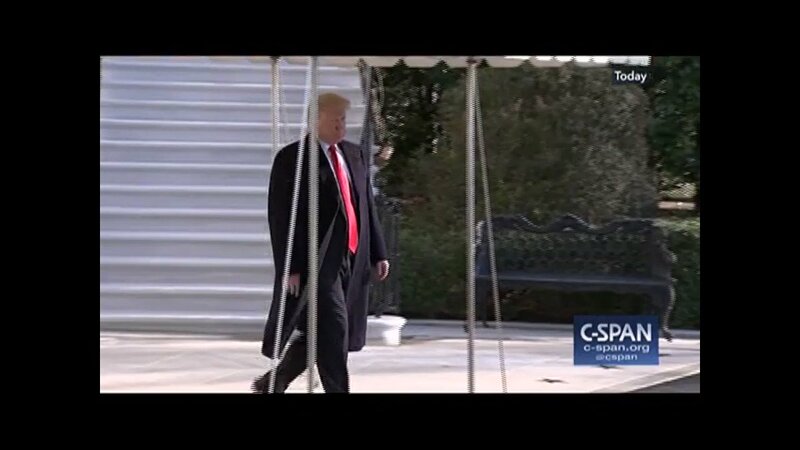 Before departing White House for Camp David, Trump tells reporters, "we have to build the wall or we have to build the barrier. The barrier or the wall can be of steel instead of concrete, if that helps people. It may be better [for the domestic steel industry]." 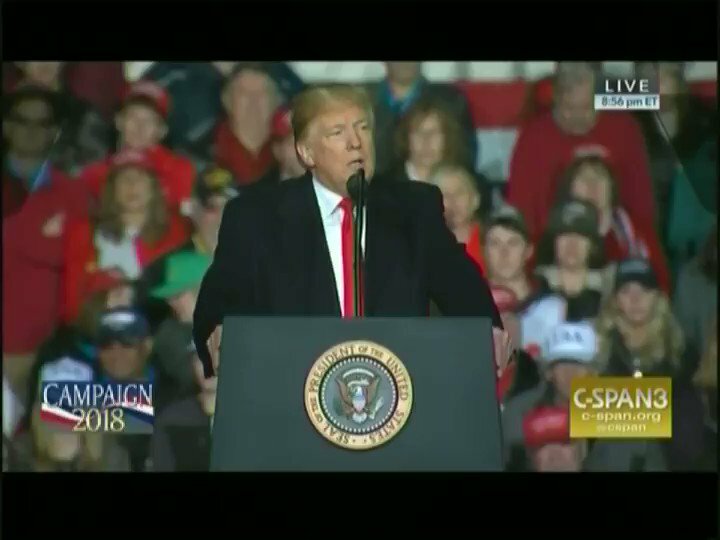 TRUMP: "I intend to call head of US Steel & a couple other of our great steel companies to have them come up w/a plate or design of a beautiful steel product, which we now make here, & we'll use that as our barrier"
TRUMP on federal workers who are missing paychecks: "I can relate, & I'm sure the people on the receiving end will make adjustments -- they always do... but many of those people that won't be receiving a paycheck agree 100% with what I'm doing." 2. First, I don’t know how anyone who had lived in Wisconsin watching its politics over the last decade could have been surprised Walker approved what the legislature sent him. It is probable he was consulted extensively long before the legislature acted. 3. Scott Walker & Republican legislators in Wisconsin are served by the same campaign infrastructure, and serve the same large donors. They can disagree about some things, but must always be assumed to be of one mind on anything related to funding campaigns & winning elections. 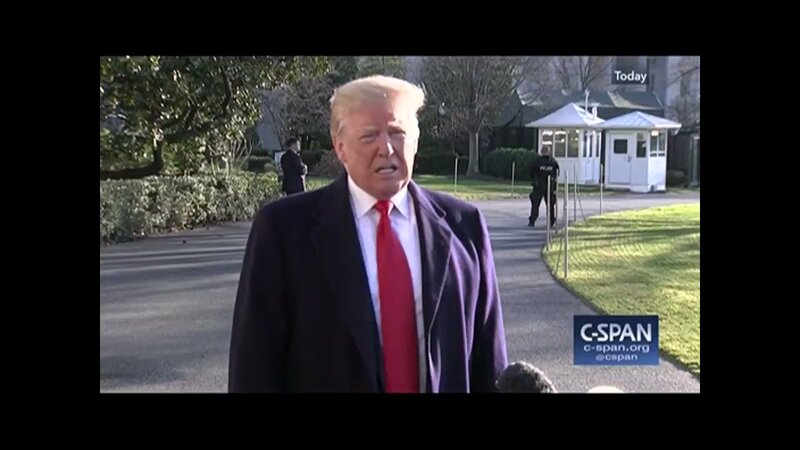 2/"President Trump has spent the past 18 months employing the megaphone and power of the presidency to actively, concertedly and deliberately incite civil and racial conflict on as many fronts as possible. Now he wants us to believe he is working to bring the country together. 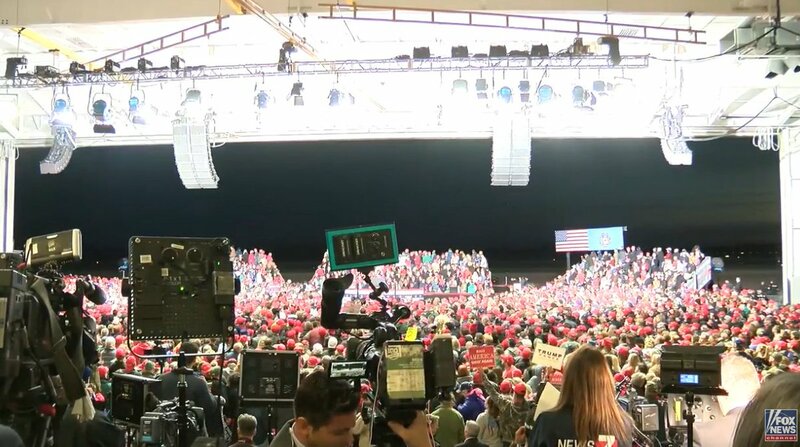 Trump is doing a campaign rally in Mosinee, Wisconsin. Tweets in this thread. Yes, this is coming to you live from a Pennsylvania motel.